Most property owners are, of course, aware that they pay home insurance but not many will be aware of what to do in the event of having to make a claim. Firstly, don’t panic! The claims process isn’t as complicated as you might think and if you go about it in a methodical, sensible fashion your claim should be successful. Step one – If you’ve been burgled, suffered malicious damage to your property or lost something of value, call the police. You’ll need a crime reference number to use in your insurance claim (without this, your claim will probably be rejected). If it’s a claim for a loss, take all practical steps to get back the item or items. Step two – Find your policy document, schedule or booklet and call the helpline number to inform your insurer of what’s happened. Do this as soon as possible. 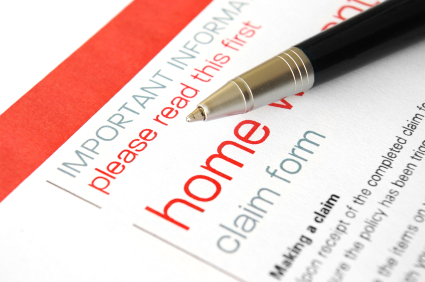 Step three – Fill out the required claims form. This must be returned within a stated number of days (don’t go over the limit as this as it will affect your claim). At this point you will usually have to provide proof of purchase, such as receipts. If you can’t provide these, use bank or credit/debit card statements. Photographs will also help, if you have any. Step four – Usually depending on the size of the claim, your insurance company might send an investigator to your home (this will almost certainly happen in the event of a large claim). This is partly to assess and confirm any loss or damage, and decide on compensation, but also to assess the validity of a claim. Step five – Depending on the results of the subsequent report the investigator makes, the insurer will organise the repairing of damage or any necessary building works. If it’s a claim for contents, you’ll receive payment to your bank account or via cheque. As with nearly all insurance claims, the insurer will deduct the policy ‘excess’ before settling a claim. The excess is the first part of a claim that you must cover before the insurer pays the rest. It’s agreed with you when you take out the policy; usually, the bigger the excess the cheaper the cover. Making a claim may also push up your premium at renewal time. However, if you shop around and use a broker you may find that you can get the same cover for less elsewhere.